A series of disasters caused a group of students to become stranded in a department store in Monument, Colorado in Monument 14. In its sequel, Sky on Fire, the majority of the students have left the store in a school bus, on their way to find help, while Dean, Astrid, and three of the younger kids remain in the department store. I really loved Monument 14, so I was very excited to read this book. I liked the way the story was told in this book–since the group has split in two, the book is told from both Dean and his brother Alex’s perspective. This worked extremely well because the reader is able to see what is happening to both groups at the same time. I liked how Alex’s story is told as though he is writing a letter to Dean–this made his story even more personal. I thought Dean was crazy to stay in the department store initially–especially for Astrid. She seemed to just be using him since her boyfriend left her pregnant and alone, and Dean seemed like an idiot for still trailing after her like a lost puppy. However, I really liked where their relationship went in this book. Dean realizes that she is not the greatest person ever, but he is still able to care about her and take care of her despite her faults. Astrid grows to realize how much Dean cares for her and seems to get more mature as the book goes on. In the first book we didn’t really see much of what was going on outside of the department store, other than what the kids had seen or heard on the news. In this book, since Alex and the rest of the group leave the store to search for the airport in Denver, we finally get to see what the world outside of the store is like. Depending on what blood group each person is, they have different side effects from the chemical spill. The type O people have become aggressive and are attacking people left and right. Some people have tried to stay in their homes and wait it out but they are beginning to run out of food. Alex knows he has to try his best to find help and go back and save Dean and the others at the department store before it is too late. However, before he can save his brother he must overcome the seemingly impossible obstacles in his path. Overall, Sky on Fire was a fast paced read that kept me on the edge of my seat the whole time. I can’t wait to see what Laybourne has in store for the next book! 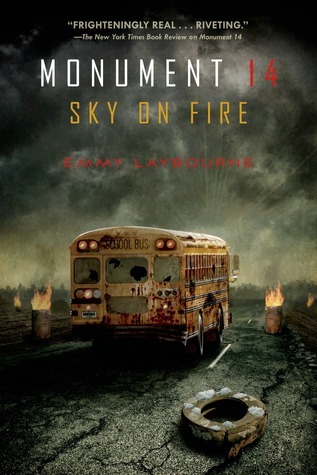 Sky on Fire was released on May 28, 2013 and is the second book in the Monument 14 series.